The Raspberry (or Raspberries) is a small edible fruit from a prickly Rubus shrub from the Rose family. Raspberries have a tart taste and sweet aroma. There are also red, black and golden varieties of this fruit. Raspberries are high in Vitamin C, fiber, manganese and antioxidants. A strong-flavoured berry made up of many connecting drupelets. It has different varieties which includes golden yellow in color, black, purple, and red. The most common type is red. Choosing: Look for deeply colored fruit that is plump and soft but not mushy. Avoid those that are moldy or too ripe. Overripe berries will reveal themselves by leaking through the container. Select those that have a deep color and good aroma. If buying in a container, check the bottom to see if it is stained or leaking juice as this indicates that they are too soft and are already overripe. The best way to get raspberries is to pick your own. Select those that are bright and even colored. When berries are ripe, they should pull off the hull easily. Make sure you pick ripe raspberries because once they are picked, they don't ripen anymore. Buying: Grocery store, fruit stand or U-pick farm. Procuring: Raspberry plants grow in most temperate regions easily and has tendency to spread. The fruit is harvested when it comes off the receptacle easily and has turned a deep color. This is when the fruit is ripest and sweetest. Raspberries are fragile and thin skinned, and should be chilled promptly after harvest. Picking in the morning while still cool, allows for slightly extended shelf life. However, picking while dew is on the plant can increase the spread of diseases. Most common and most cultivated variety is the red raspberry. However, other varieties exist which include the purple-flowering, the black raspberry, and the golden raspberry. Other berries related to the raspberries are often considered to be the same fruit are the wild raspberries and the Arctic brambleberry. Raspberries are grown for both the fresh fruit market and for commercial processing into individually frozen fruit, puree, juice, put over ice cream, mixed with yogurt or as dried fruit for various grocery products. It can also be made into jams or be frozen. Raspberries are used in salads, puddings, cakes, tarts, and other desserts. They are added as a topping on cereal, waffles, and pancakes. Raspberries are used to flavor vinegar, and are also used to flavor, wine, champagne, liqueurs, and spirits. They can also be cooked and made into jellies and jams. Because raspberries have an intense flavor, small amounts can be used in recipes and are often blended with other fruits and juices. Cleaning: Before storing, carefully inspect and weed out any piece that are spoiled or overripe as these might contaminate the rest. Raspberries should not be washed until immediately before serving. Because they are fragile, some recommend not washing them at all. But if you intend to, using a light touch, wash them quickly and gently so that they don't soak up too much of the water and become mushy. 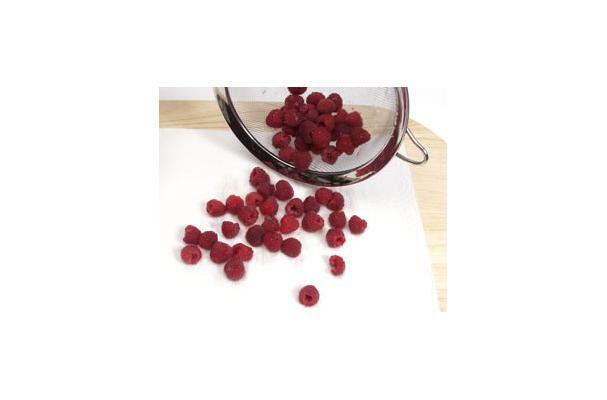 Store unwashed berries in their original container although it is best to spread them in a single layer on paper towels Although it is fine to cover them loosely with plastic wrap, it is recommended that you store them uncovered. Raspberries will last in the refrigerator for a day or two. To store them for a longer period of time, you can freeze them for up to one year. The best approach is a two-step process. First, freeze them in a single layer on a cookie sheet then transfer the frozen berries to an airtight container. Even when frozen, raspberries are rather fragile, so choose a container that will protect them. History: Common wisdom places the wild raspberry's earliest days in eastern Asia, with the natural propagating of berry bushes around the world via birds, animals, and human travellers. The plant's cultivation didn't start formally until the 1500s. By the 1800s, raspberries were becoming quite popular. Contemporary world leaders in commercial raspberry production include Chile, Poland, Russia, Yugoslavia, Germany, and the United States.